Breaking news! PR Luxury Media has announced the list of Influential Women in Business in ReviewIt Magazine’s February 2017 issue. PR Luxury Media’s Women in business are making a difference each and every day. These women are hard-working leaders, innovators and trailblazers across The Woodlands, Lake Conroe, Montgomery, Magnolia, Spring, Tomball and Champions. 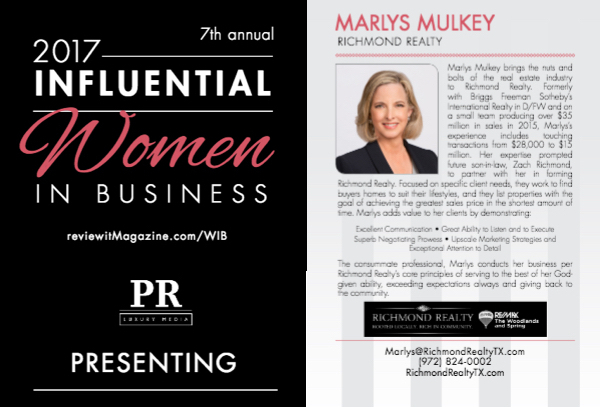 Marlys Mulkey, Co-Founder of Richmond Realty RE/MAX The Woodlands and Spring, is one of the women featured – and well deserved for her years of experience, excellent service, exceeding client expectations, and giving back to the community.